Exit I-10 to I-110 North. Take Exit 1C at Florida Street. (This is a left exit.) At the bottom of the exit ramp, turn left onto N. Tenth Street. Free parking is available under the Interstate. In heavy traffic or if you miss the Florida Street exit, take the North Street exit, Exit 1D. At the bottom of the exit ramp, turn left onto N. Ninth Street. Free parking is available under the Interstate and accessible from N. Ninth Street. Take Exit 1G (N. Ninth St/Capitol Park). Stay in the right lane and continue four blocks, the last two are Main Street and then Laurel Street. Free parking is available on your left under the interstate and accessible from N. Ninth Street. FREE PARKING under the interstate. (see map below). Handicapped parking is provided on Laurel St. and Florida St. 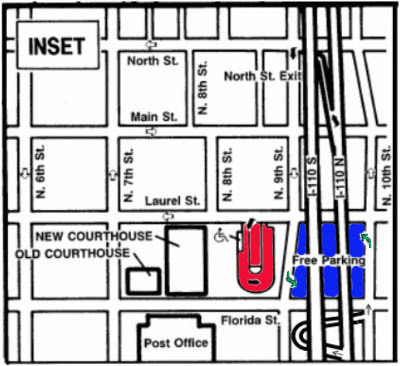 In the event the public parking under the interstate is full, a large parking lot is available at the corner of Florida and Sixth Street to the west of the of the courthouse, and within walking distance. The cost for parking will be reimbursed to jurors. RED highlighted parking is reserved for Employees of the Court ONLY. BLUE highlighted parking is free to park, located under the interstate.